The 24.2 metre explorer yacht Andros, jointly listed for sale with Fraser and Van der Vliet Quality Yachts, has had a further €275,000 price reduction. Built by Aluship in steel and aluminium and delivered in 2014, this no-nonsese, go-anywhere explorer yacht is well equipped for world cruising and can easily be run by a minimum of crew. 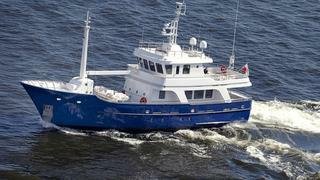 She has a range of 3,400 nautical miles at 8.5 knots thanks to her twin 340hp MAN engines. Designed inside and out by Vripack, Andros’s combination of robust construction and modern interior creates a great live-aboard environment. Special focus has been placed on her heating system, allowing guests to remain comfortable for longer in the colder regions. Four guests are accommodated on Andros in two guest cabins, with additional space for two crew aboard this yacht for sale. Commissioned as a research vessel, she was built for an owner who wanted to explore deep sea areas, particularly in Scandinavian waters. She is equipped with modern electronic equipment and an ultra-deep underwater survey field is created by a sophisticated Far Sounder installation, a navy grade system. The bridge offers 360-degree visibility and is a roomy area with an observation couch opening out onto the main deck. A garage aft houses a tender with the option to house a second tender on the mid foredeck. Unusually, a garage amidships houses a four-wheel-drive Land Rover with a custom system enabling roll-on roll-off service. Andros is now asking €2,675,000.